My heart is heavy today as we commemorate the 10th anniversary of the US-led invasion of Iraq—an unjust and arguably illegal preemptive action. While it is tempting to be consumed with the election of Pope Francis this week, I believe it’s important for us to take some time to reflect on this anniversary. A decade ago I was quite active in the anti-war efforts. I marched in Washington, DC; I organized study sessions; I dressed in black in protest; I wrote to members of congress; I even fasted for a time with a group of Dominicans and peace activists in New York. But still, I feel as if I failed. The war happened. As president of the International Movement of Catholic Students (2003-2007), I undertook a solidarity visit to Iraqi refugee youth. I had the chance to meet refugees and see their plight in Jordan and Lebanon. I was warmly welcomed into an apartment of one Iraqi refugee family in Amman who shared with me how the war destroyed their lives. I celebrated Mass with Iraqi refugee communities in the ancient rite. I communicated with Iraqi Catholic students and mobilized advocacy efforts at the United Nations. And still, I feel as if I had failed them. Despite my efforts I could not stop the suffering. Did I do enough? Mission accomplished or is it mission forgotten? a total economic cost of 2.2 TRILLION dollars. While major news outlets in the UK are running a special series this week, most American news sources (complicit in the hype and lead up to the war) are choosing to pay little attention to this anniversary. The New York Times, for example, has publically stated that it is taking a low key approach. How can we take a low-key approach to a massive error in politics, morality, and humanitarianism? For many of us, it is easy to ignore. Most of us don’t know soldiers who were sent to Iraq. Most of us don’t know Iraqi refugees. But maybe our amnesia here is as a result of something deeper. Perhaps we choose to ignore it because we know in our hearts that we are responsible. Thankfully, the people of Iraq have not been totally forgotten. A few stories in the Catholic media have stressed the church’s responsibility. Bishop Richard Pates of Des Moines and chair of the USCCB’s Committee on International Justice and Peace, visited Iraq two weeks ago as the Chaldean church installed a new patriarch. Ultimately, however, the coverage has been weak so far as it has been all along. All of us are responsible. We live in a democracy and the actions and inactions of our government are ours to carry. In this time of Lent, we are called to repentance; to repent of our past sins and work for reconciliation in the future. How will we repent of our sins for this war? How will we honor all those who have died? What can we do for those who are still suffering? How will we never allow something like this to happen again? I pray that Pope Francis, a name that carries with it a vocation to build peace, will inspire us to prevent something like this from ever happening again. The Lord’s hand plays on it. We are integral the one to the other. As the columns of the temples we stand together but separated. We are the dream of tomorrow and the memories of the future. We are persons working for a kinder world than the present one. Our weaponry and our work is our Love. Ambassadors for what is possible. We are like the seeds under the snow waiting for the spring. to be the green leaves in the Tree Of Life. 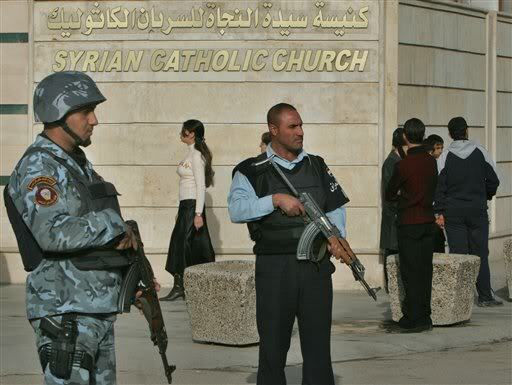 I’ve recently gotten to know an Iraqi Chaldean Catholic priest who has talked about the persecution of Christians there being exacerbated by the American occupation, since Christians are now being equated with it – despite the fact that Christianity has very ancient roots there, much older than Islam itself. As a Christian and an American, I am deeply grieved by this. I agree fully. And this is also happening in the other ancient churches in the middle east. Our bishops have spoken a lot about religious freedom, yet we seem to ignore the negative consequences of our international policy on others. There are many Eastern Catholic refugees in the USA. I would warmly encourage everyone to reach out to them.